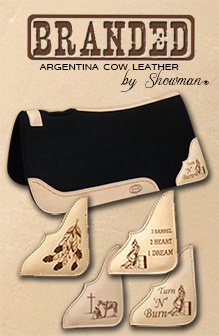 Showman ® Turquoise and White leather laced browband headstall and breast collar set. This set features medium oil leather with a turquoise and white leather lacing on headstall cheeks, browband, and breast collar. Breast collar is accented with a turquoise suede and white leather fringe accented with silver studs. Conchos and hardware are accented with clear crystal rhinestones and turquoise beads. Headstall comes with 5/8" x 7ft leather split reins.